An overturned semi is blocking nearly all lanes of eastbound I-80/94 at the Cline Avenue exit in northwest Indiana. HAMMOND, Ind. 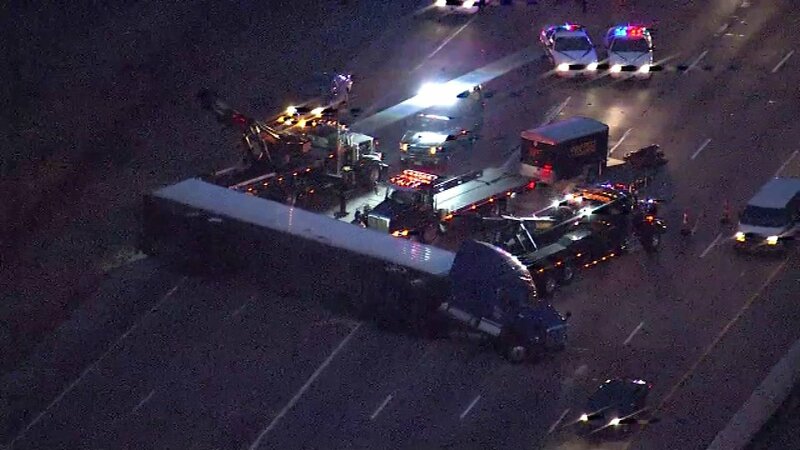 (WLS) -- A rollover crash involving a car and a semi resulted in the truck blocking nearly all lanes of eastbound I-80/94 at the Cline Avenue exit in northwest Indiana for about three hours Thursday morning. A black 1996 Toyota Camry was eastbound on I-80/94 just west of the Cline Avenue overpass in Gary at 4:45 a.m. when it made an unsafe lane change into the path of a purple 2016 Freightliner, Indiana State Police said in a statement. The semi hit the car and then veered right across all the lanes before swerving back to the middle left lanes, which caused its trailer to overturn, police said. The tractor and the trailer, which was loaded with 40,000 pounds of produce, ended up blocking three lanes of the expressway and the ramp to Cline. There were major delays on eastbound I-80/94 throughout the morning commute. Emergency crews were able to upright the semi and clear the scene. All lanes were back open by around 7:50 a.m. The Camry's driver, 58-year-old Robert Achterberch of Lynwood, was cited for excessive speed and unsafe lane movement, police said. The semi driver, 57-year-old Delores Murray of Port Byron, New York, was cited for speed. Both drivers were wearing seatbelts at the time and neither was injured, according to police.